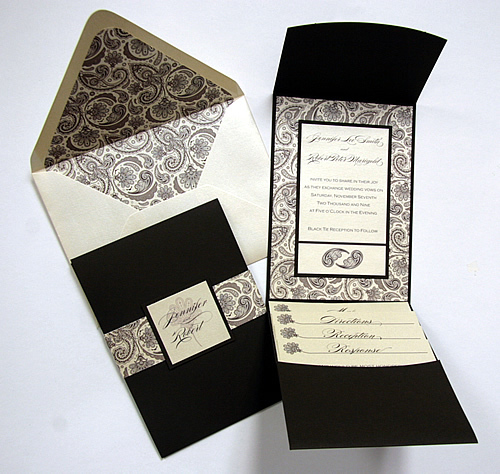 This classy Pocket Invitation is comprised of a Bitter Chocolate & Cream color scheme with the Paisley Floral Customized Paper. You can customize this patterned paper by having it printed in any color! We can even print in your own CMYK color code. Try bright jewel tones for an Indian-themed Wedding or event! I LOVE this invitation – all the way down to the fonts! Would you mind sharing? We just ordered your swatch book – and plan on mimicking our invitations to this one with our colors. Love the blog – keep it up! Thanks for the comment! Feel free to email printing@cardsandpockets.com regarding the “Paisley Floral CoffeeBean Invitation” from the Blog, and they will price it out and customize it for you!!! Happy Planning! Keep coming by!! Very nice layout. What dimensions did you use for the mini mat and mini invite? Very Nice! I am also using the Paisley Floral custom paper that I ordered from Cards and Pockets and I love how you incorporated the Paisley Floral elements onto other part of the invitation. Is it possible to get a vector file of the paisley floral print for my invitations? I’m interested in the Paisley Floral Coffee Bean PocketFold Invitation as well as the Citron Scribble Floral PocketFold Invitation. I would like to know all that is included, the price, and when I could receive them. Thanks!